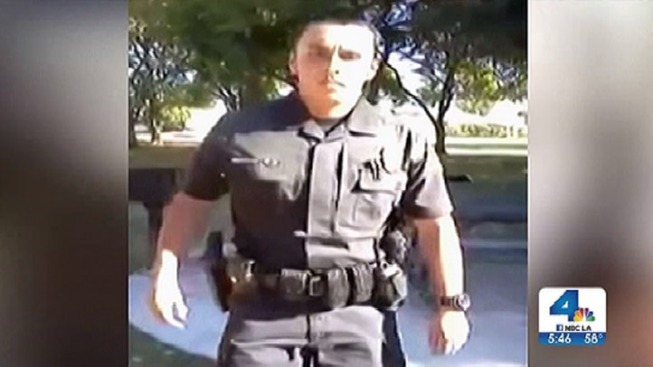 Oxnard police are being questioned after a YouTube video posted to their Facebook page ends with an officer appearing to aggressively reach for a cell phone being used to film another officer making an arrest at Eastwood Park. The video, posted to YouTube Wednesday, currently has more than 2,000 views. Police were not aware of the video until it was posted to the department’s Facebook page. It has some officials within the department shaking their heads. "When I first saw it I thought it was a hoax," Assistant Police Chief Scott Whitney told NBC4. "It's not the way we do business; it's not the way we're trained, so I wasn't happy when I saw it." It’s unclear what precedes the incident, or what follows after the video ends, but a 21-year-old man, who claims to have shot the video spoke with a blog called www.photographyisnotacrime.com. The man, going by "Angel-B," claims he was pushed into a picnic table as the officer continued to take his cellphone away. He said another officer stepped in and stopped the alleged aggressor. Some Oxnard residents, who chose to remain anonymous out of fear of retaliation from police, say they aren’t surprised by the video. A man who says he’s had run-ins with the department claims there is a widespread feeling of distrust with the department. "This is far from an isolated incident but it is rare for a police department to publicly respond to the criticism, assuring they will investigate, so credit must be given to the department," Carlos Miller, who runs the blog, said in a statement to NBC4. "We look forward to hearing the results of that investigation." Whitney assured the public that they should not fear the department. "Our officers get disciplined when they make mistakes, people make mistakes. There's no need to fear for retaliation," Whitney said. Oxnard police say they would like to speak with the man who shot the video. In an e-mail sent to NBC4, the man says he is willing to meet with police, and he plans on recording it.